Music is the food of the soul. It is an experience that filters into our conscious and unconscious minds through our auditory ability. It evokes deep feelings and stirs your imagination to form images. But how do you write a music review? How can you express in black and white the colors and images that are created? It is not really that difficult. Once you learn the format and method, it is just a step away from writing a good music review. Of course, to do that, you have to appreciate music and able to distinguish the different tones, or, in brief, have an ear for music. As part of art and cultural studies, you may find yourself called upon to write music reviews. Even though the music itself represents the expression of creativity through sounds, writing a music review requires the same amount of diligence and attention to order and method, just like other academic essays.If you are not sure as to how to write a music review, just place an order with our cheap writing service and let our writing experts take care of your review. 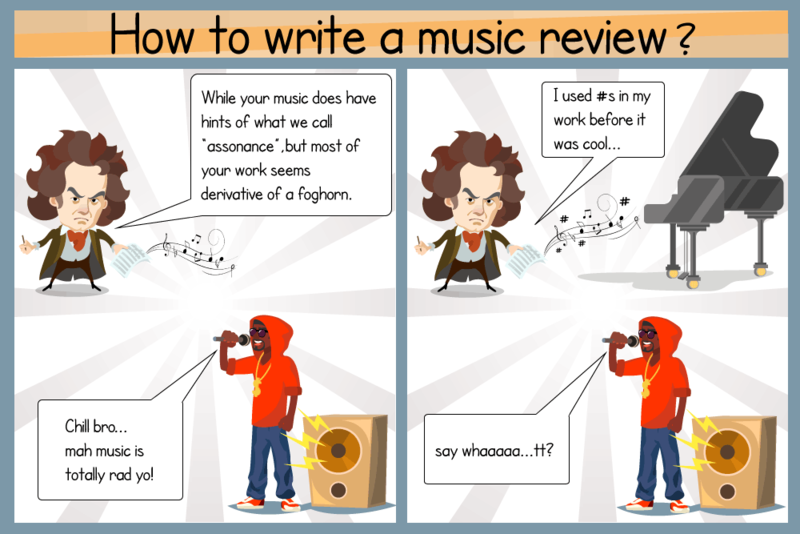 What is a music review? Q. How do ghosts write a music review? A. 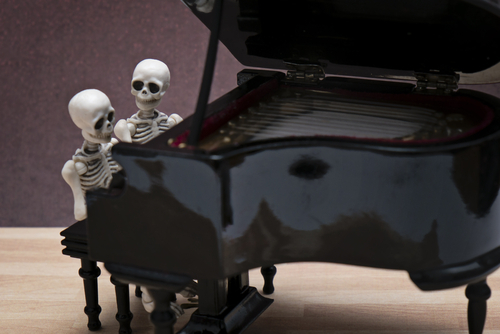 They read the sheet music. A music review, is thus, your opinion about a piece of music you have listened to, either as part of a performance or in the form of a recording. Since your music review would be read and analyzed by your teachers, you should structure your writing keeping this audience and their expectations in mind. Writing music reviews can be tricky, as the music itself has many diverse genres. Music can be vocal or instrumental; it can be classical, semi-classical, light music, regional music, music from different countries and continents, or music of nature. The student must be familiar with the basics of musical theory, different musical styles and kinds of music. It would be of immense help if you are a musician yourself, as you are better able to understand the nuances of music. Knowledge of music history and association of music with other cultural developments of the period is a great advantage. What are the parts of a music review? As all essays, music reviews too follow the same general framework: the introduction, the body, and the conclusion.But before actually writing the review, it would be best to read up on some literature regarding that piece of music written by other critics. This, and some background reading of the genre, performer and the piece of music itself would help in giving you an in-depth understanding of the same. The reading will also help you get some sources to support your arguments in the review. Every good reviewer also takes into consideration others’ assessments too, whether they agree with them or not. As a result, you will be able to build up a strong case for your stance and make it more comprehensive. The introduction of your music review should highlight the theme of the review and its purpose. You must begin with the title, the performer, and other necessary details that could help the reader find the music piece.Then explain the purpose of the review. A brief context would help. A short paragraph with the background information you have collected would aid in attracting and retaining the interest of the reader, and also showcase the depth of your knowledge about it. The introduction should highlight the key opinion you want to make, the overall impression of the music you listened to and whether you recommend it to others. The main part of the music review is the elaboration of the piece of music, which is described in the introduction The review can be divided into several portions. You can start with the overall impression of the piece. This is followed by individual aspects of the performance such as the quality of the performers, instruments, and supporting instruments. The theme of the musical performance is a very important aspect of the review. Many compositions have an underlying inspiration and there is a context in which they are created. You can discuss the history of the music- whether it belongs to the classical period or to the modern era. The style of singing can be commented upon. Different eras in the period of human history have led to the creation and popularization of different forms of music. In addition, some types of music have powerful religious and political significance. Describing the piece of music in all these terms would help create a vivid impression in the minds of readers and they would develop a better appreciation of the piece of music. The review can also elaborate the qualitative aspects of the performance- how was the performance? Was it spectacular or ordinary? Was it technically brilliant? Were there any unique aspects of it? What were the lyrics like? Were they meaningful and did they add to the power of the performance? Was the performance varied and did it have different styles? One can describe the feelings generated during the performance.As mentioned earlier, music relates to the feelings of the listener, rather than the intellect. Consequently, the feelings that are evoked by the performance are very important. The performer and the composer would aim to induce certain specific feelings in the listener. The very success of the performance lies in achieving just that. But if this is not done, then the performance has not come up to the expectations of the creator or the audience.So, a good music review must also include the emotional state that is induced by the performance.You can even discuss and compare the previous performance of the singer/group/ensemble/soloist/instrumentalist to the current performance and define as to how it adds value. In the conclusion, you need to wrap up the various aspects of the performance you found interesting and mention how this particular piece of music is of value to current and future generations.